History has a weird way of connecting things. We connect the greatest photographer of all time, Henri Cartier Bresson, with Leica who he adored and vaulted. 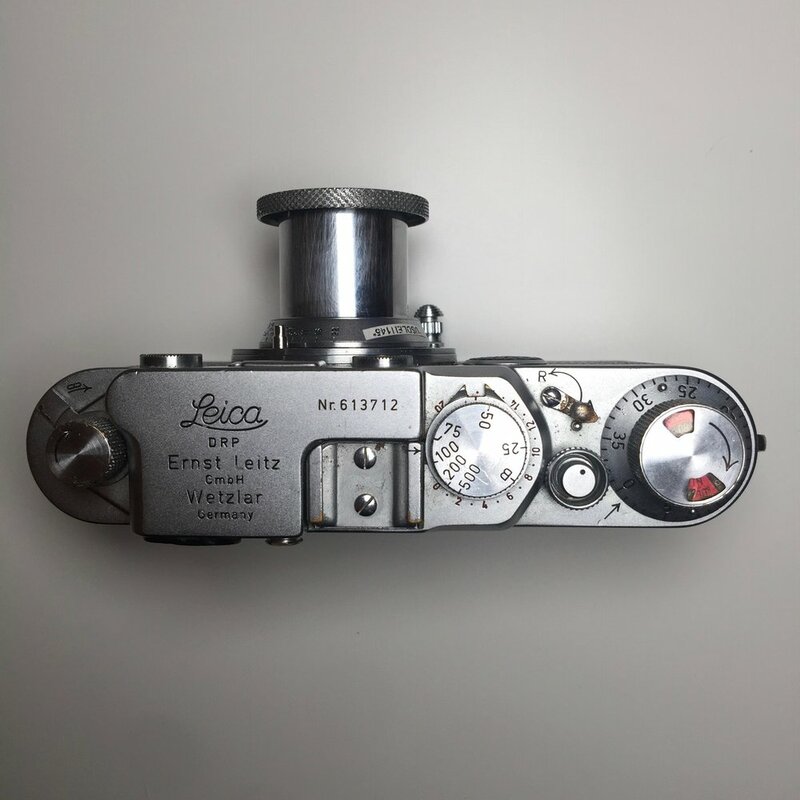 The ultimate Leica is the M3 which was released in the 1950's. When Henri was making his incredible images in the 1930's he was using a variant of the Leica III and most likely a standard 50mm F3.5 lens. I had been looking for a reason to get the standard lens and when I saw a deal on the Leica IIF (no slower shutter speeds and self timer compared to the IIIF) I jumped on the deal. With a trip to San Antonio around the corner during the Fiesta celebration it would be a perfect time to test the old body and lens. The first thing I noticed about the camera was: it's definitely from a different era. Film loading is complicated. I needed to cut the film leader to accommodate the spool. Once trimmed you load the cartridge and place the roll and spool into the camera. One trick is to make sure the film is firmly locked on the advancing gears otherwise it will spin continuously without advancing the film, a problem with the newer M's too. Next the rangefinder and viewfinder are split both being in separate windows. With a camera like this I'm shooting using hyperlocal distance 85% of the time so it wasn't a huge issue. The times I had to switch between the rangefinder and viewfinder were a clumsy at first but became natural and fluid after a few rolls. Both viewfinder and rangefinder are also minuscule compared to modern standards. Advancing the film was done via a round dial and not a lever and film rewind was a simple knurled knob. It took extra time to do everything on the IIF. I've shot with some older cameras, and compared to the clunky and awkward Argus C3 the Leica was much closer to a modern shooting experience but still not as user friendly as a Pentax K1000 or Nikon FM. The other functions of the IIf are extremely familiar and intuitive. Aperture is set on the lens, shutter speeds set on the top of camera (only after the film is advanced) and focusing is normal. The camera once set up has an amazing ability to get out of the way. Being lighter and simpler than a SLR it can truly be a pocketable camera with a collapsible lens. I can easily see Henri Cartier Bresson keeping the camera on him at all times in a coat pocket and carrying a few extra rolls of film. It also handles as a fully formed and developed camera, everything on the camera is laid out and connected in a logical way. It's the type of thing that you could pull out of your pocket, extend the lens and take a shot within seconds. The weight and balance of the camera are solid and the shutter is nearly silent. Walking around in 2018 shooting a camera from the 1940s can be an awkward experience. If you're carrying around a TLR or Graflex, eyeballs are going to follow your every shot. The IIf blends into the scene with it's classic design and usability. No one asked what I was using and I rarely got a second glance. The images from the IIf came out as I expected. In direct sunlight metered correctly it performed extremely well, like all cameras should. Older lenses are known for being softer at lower apertures but I really couldn't find any conclusive examples. Shooting at hyperfocal near sunset gave me some great images with contrast and depth. I did have a few shots where a beam of light flared out the image but I think a hood should solve that issues easily. Shooting with the Leica IIf was a very fun and informative experience, I don't really need the camera but after buying it I'm going to keep it because of how portable and unique it is. It's not the type of camera I'd recommend for someone just getting into film or looking for a cheaper Leica experience, it's finicky and there are much easier ways to start. It is a throwback camera and a great portable system. As a backup or a change of pace camera it can be a real treasure.